Real 100-meter sprinter Calvin Smith, competing in the Olympics, and the ideal (above and left) stick-figure runners generated by computer of high-tech trainer Gideon Ariel. The figure of a runner is digitally copied into a computer and reproduced to analyze the runner's style. Ariel expects to clone the muscle patterns of superstars for use by other athletes. Moses has come closer to perfection than any athlete in history A twotime Olympic gold medal-winner in the 400-meter intermediate hurdles, he has set new world records on four separate occasions. Undefeated in his event for the past eight years, he has sprinted to victory 109 times in a row No other runner has ever done so well in a single race so often. What makes Moses's accomplishment so extraordinary is the sheer intricacy of his event. To win, he must cover 400 grueling meters while nimbly leaping ten 36-inch-high hurdles. 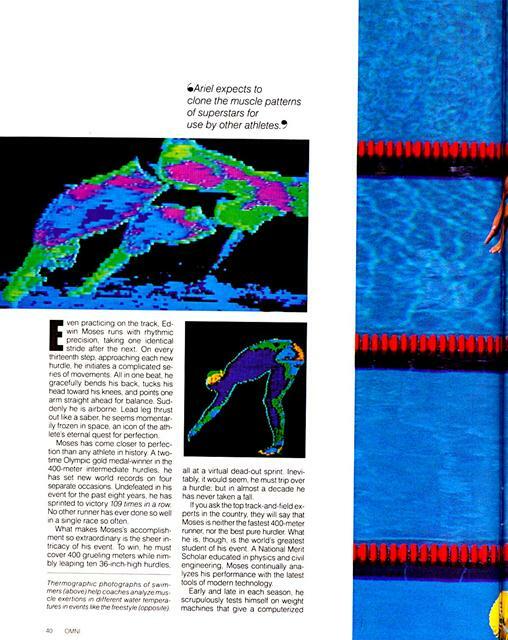 Thermographic photographs of swimmers (above) help coaches analyze muscle exertions in different water temperatures in events like the freestyle (opposite) all at a virtual dead-out sprint. Inevitably. it would seem. he must trip over a hurdle, but in almost a decade he has never taken a tall. If you ask the top track-and-field experts in the country, they will say that Moses is neither the fastest 400-meter runner, nor the best pure hurdler. What he is, though. is the world's greatest student of his event A National Merit Scholar educated in physics and civil engineering. Moses continually analyzes his performance with the latest tools of modern technology. readout of his strength and power in different body regions; at a glance, he can see whether he has muscle imbalances that may slow his speed or even threaten injury. He has worked with a team of technicians and engineers to take high-speed videotapes during training, then studied the tape frame by frame to pinpoint any flaws in his technique. And during his most grueling workouts, he wears a heart monitor that records his pulse rate every 30 seconds and relays it to a computer memory in his wristwatch. Hours later, he records the pulse measurements and his corresponding practice times on a home computer. "I plot the figures out on my computer's bar graph, with training times on one axis and pulse rate on another," says Moses. "If I run three miles five days in a row, I can see a marked change on the graph. By the end of the week, my heart rate is going up higher and staying up longer. then coming down faster and lower at the end of the workout. That tells me I'm conditioning. In this way I can see my progress visually over time." But despite Moses's reliance on technology, fellow athletes don't consider him a maniac. Far from being an anomaly in sports, he is a respected pioneer. Like the protohumans who carried the first blunt clubs into battle or the hunter-gatherers who sent the first wheel careening down a hill. he is a harbinger of things to come. With each passing year, the once straightforward (throw it fast, hit it hard) world of athletics is becoming increasingly complex. To survive, competitors like Moses are resorting to an array of strategies continually developed in research labs and on the playing field itself. Working hand in hand with physicists, physiologists, and psychologists, they are forging the techniques that will revolutionize athletics in the twenty-first century. Computer programs that analyze the motion of every limb and muscle, suggesting how the athlete can alter his or her movements for optimal performance. An extensive series of diagnostic tests to identify future world-class athletes and determine the best sport for each individual. *Electrodes that literally program an athlete's muscles with electrical signals taken from superstars. Biofeedback devices that measure physiological features from heartbeats to brainwaves, helping the athlete to fine-tune performance from moment to moment during a game or event. These possibilities are natural outgrowths of research that has gathered momentum for more than 20 years. The spiritual father of high-tech sports, workaholic Israeli Gideon Ariel, got the ball rolling (so to speak) shortly after the 1964 Tokyo Olympics. Back in the Fifties, Ariel was a large and clumsy adolescent obsessed with becoming an athlete. After scrutinizing his options, he decided that the discus offered him the best chance of success. He was built for it, and besides, the top Israeli discus thrower had managed only an embarrassing 160 feet. "I can do better than that," Ariel told himself and began four years of training that Sports Illustrated once called "almost demented in its intensity." Despite his lack of natural ability, Ariel made the Israeli Olympic team in 1960 and 1964. Under the guidance of his coach, LeRoy Walker, who stressed a scientific approach to athletics, he eventually managed to break the Israeli record just before the 1960 games in Rome. A few years later, driven by his love for sports, he went on to study exercise science at the University of Massachusetts. He pursued his graduate studies with the same intensity he'd given to the discus, paying careful attention to the laws of geometry and physics stressed by Walker. Ariel soon understood that the laws of nature were not truly accessible to the human eye. 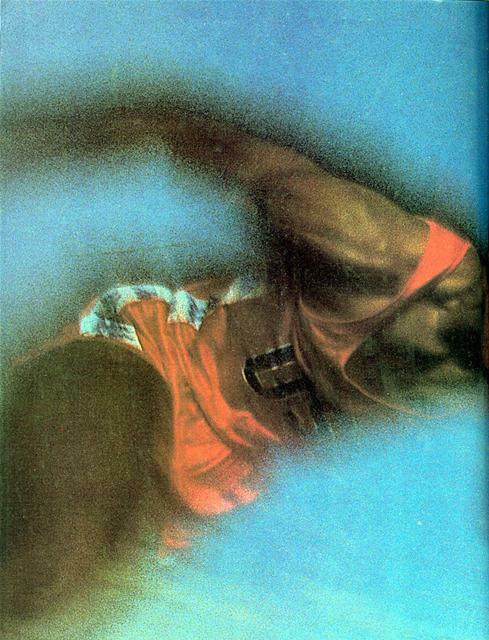 To compensate for the eye's deficiencies, he began to film athletes with highspeed cameras. Then he took the film and manually calculated the motion of limbs and other body segments frame by laborious frame. Using the laws of Newtonian physics to measure performance, he discovered an astounding fact: Even superstars made moves that were wasteful or completely wrong. Moreover, when they modified their movements to conform to Ariel's analysis, their performances invariably improved. But this new "biomechanical" approach (in which the body was treated like a mechanical system) still had limitations. Because the mathematical formulations were so complex, Ariel could work with only a small number of athletes. And he certainly couldn't analyze the dozens of body segments that come into play. Then, in 1968, Ariel discovered the computer. He was walking through a medical lab at Dartmouth when he saw someone using a wand to touch a moving image on a television screen. The fluctuating image, Ariel explained, was of an expanding tumor. The screen on which the tumor appeared contained hundreds of tiny microphones. Each flick of the wand (actually a sonic pen emitting sound waves) activated one of the microphones, which relayed its position on the screen to a computer's massive memory. In essence, the computer was charting the coordinates of the tumor as it grew. Watching the Dartmouth system, one of the world's first electronic digitizers, Ariel realized this was the technology he had been looking for. He could film athletes, then use the digitizer to automatically enter their subtlest motions into the computer. Once the data were entered, Ariel's program could create stick figures of an athlete in motion. By modifying the figures to test different positions and speeds, Ariel would finally arrive at an optimal model whose mechanics would lead to the best performance. It didn't take long before Ariel was recruited by the United States Olympic Committee (USOC) at its new headquarters, in Squaw Valley, California. In 1976 he helped the committee evaluate top discus throwers, including Mac Wilkins. 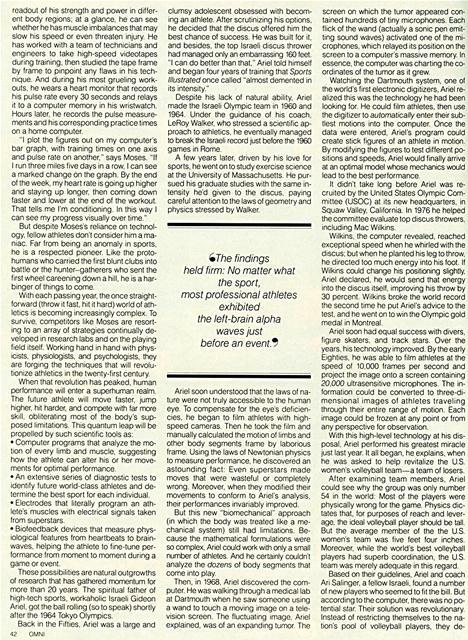 Wilkins, the computer revealed, reached exceptional speed when he whirled with the discus; but when he planted his leg to throw, he directed too much energy into his foot. If Wilkins could change his positioning slightly, Ariel declared, he would send that energy into the discus itself, improving his throw by 30 percent. Wilkins broke the world record the second time he put Ariel's advice to the test, and he went on to win the Olympic gold medal in Montreal. Ariel soon had equal success with divers, figure skaters, and track stars. Over the years. his technology improved. By the early Eighties, he was able to film athletes at the speed of 10.000 frames per second and project the image onto a screen containing 20,000 ultrasensitive microphones. The information could be converted to three-dimensional images of athletes traveling through their entire range of motion. Each image could be frozen at any point or from any perspective for observation. With this high-level technology at his disposal. Ariel performed his greatest miracle just last year. It all began, he explains, when he was asked to help revitalize the U.S. women's volleyball team-a team of losers. After examining team members, Ariel could see why the group was only number 54 in the world: Most of the players were physically wrong for the game. Physics dictates that, for purposes of reach and leverage, the ideal volleyball player should be tall. But the average member of the the U.S. women's team was five feet four inches. Moreover, while the world's best volleyball players had superb coordination, the U.S. team was merely adequate in this regard. cided to seek a superior individual from some other sport. Ariel and Salinger scoured the country. and one day, while watching a group of basketball players, they spotted the spectacularly talented Flo Hyman. She was fast on her feet, statuesque. and had long, powerful arms and terrific reflexes. She was just what the computer ordered. When Ariel asked her to join the volleyball team, she snapped. 'Are you crazy? I've never played volleyball!" But Ariel persevered. "Calm down," he told her. "You'll get a thousand dollars a month just to try it out. What do you care?" Not surprisingly, Hyman had a lot to learn. Her arms and legs were often out of synch with each other, and she wasted her speed and strength. Ariel had to use his entire biomechanics arsenal to polish her technique. "We made Flo Hyman the best volleyball girl in the world," Ariel now declares. With Hyman and other computer-picked players, the U.S. team pulled off a string of upsets and won the silver medal at the 1984 games in Los Angeles. "If we'd come in fourth," Ariel says, "I would have been thrilled." By the time of the volleyball team's success, the outspoken-some say abrasiveAriel had had a falling out with the Olympic committee. He suspected the committee was planning to modify his software without his approval. So he complained-loudly. The committee solved matters by virtually booting Ariel out of the camp. Nonetheless, the USOC (now located in Colorado Springs) executes Ariel's mandate with gusto. According to Gary Schierman, a researcher at the training camp's biomechanics lab, high-speed film, Ariel-like digitizing equipment, and a host of new auxiliary systems are basic tools for training an athletic elite. As might be expected, the Olympic biomechanics lab is a sort of technological arcade. Wherever you look, computers dominate. In one area of the room, embedded in the floor, are a set of one-and-a-half-foot-long electronic sheets called force plates. 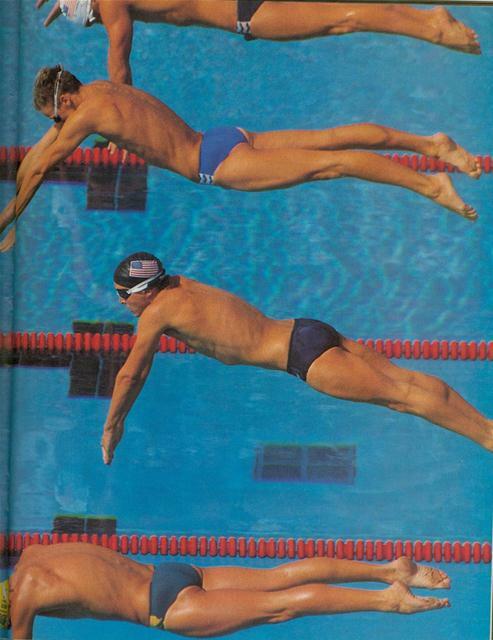 As an athlete goes through the motions of his sport, a computer records forces moving forward, backward, up, down, and side to side. In another corner, competitors attach 14 tiny sensors to the soles of their feet. Wires carry data from the sensors to small computers worn by the athletes, yielding more information on forces generated by their feet. Perhaps the most important new development in the lab, says Schierman, is the use of computers to visually depict the biomechanics of movement in real time-as it occurs. A system known as Selspot, for instance, employs an infrared camera and a set of light-emitting diodes attached to the athlete's body. The camera picks up light from the diodes and feeds an image directly into the computer. Videotape, another important tool. can't yet capture as much detail as film. But Schierman notes that it can be played back immediately, without waiting to be developed. And like the signals from light-emitting diodes, video signals can be fed directly into the computer, eliminating the tedious process of digitizing every frame with a sonic pen, This allows athletes to correct errors in seconds instead of waiting days for film. According to Chuck Dillman, head of biomechanics and sports science at Colorado Springs, this new technology was one reason for America's recent avalanche of Olympic silver and gold. He sees at least as much importance, though, in the achievements of little-known decathalon competitor Jim Wooding, who won no medals in L.A. Like all decathletes, who compete in ten sports. Wooding had strong and weak events, but he had special problems with the pole vault. "Our computer showed that his pole vaulting angle had to be higher just before takeoff and that he had to increase his speed," Dillman says. Working closely with his coach, Michael Bozeman, Wooding took the advice and quickly went from thirteenth to third in the country, taking seventh at the L.A. games. Wooding's success is noteworthy, says Dillman, because it was based in part on a computer program developed last year by Peter McGinnis, then a staff researcher. McGinnis, Dillman explains, modeled in infinitesimal detail all the techniques of the world's best vaulters, building a composite program that instantly compares today's competitors with the pole-vaulting ideal. The program breaks the body into three segments, calculating force and motion for each. As an athlete watches his performance on the screen, he can see precisely where his body mechanics depart from perfection. This kind of precision, Dillman adds, will be extended to athletes in a slew of other sports before the 1988 Olympics in Seoul, South Korea. Already, programmers at Colorado Springs are working on similar models for the long jump, the javelin throw. speed skating, figure skating, and ski jumping. But even these programs, says Dillman, will be kid stuff compared with the next generation of software-a universal sports program being developed at the lab. 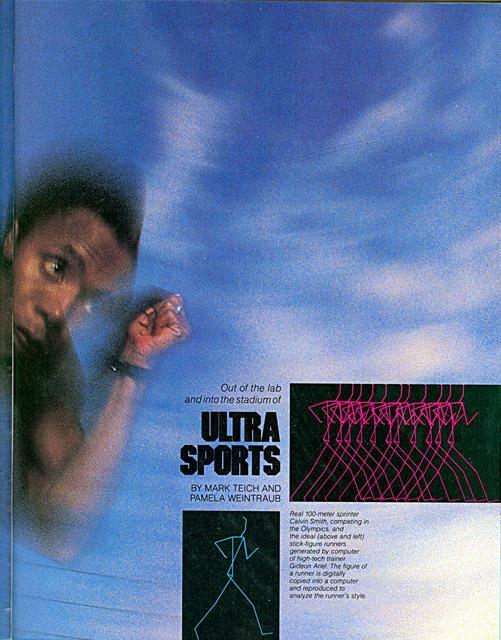 "The goal for 1992," he explains, "is a generalized human model that will do biomechanical analysis for any sport. We'll be able to modify it quickly for each individual athlete. Instead of three body segments, it will analyze nineteen segments through the entire range of motion. And it will analyze the forces exerted by specific muscles as well." heartbeats, aerobic capacity, metabolism, and innumerable blood variables for each athlete in every sport. We'll also be able to tell athletes how these parameters should vary with altitude or temperature. Our computerized tests for strength (how much they can lift) and power (how fast they can lift it) will tell them which muscles to work on for better performance in any given activity." This wealth of physiological knowledge, says Van Handel, will immeasurably improve the nurturing of athletes from the beginning to the end of their careers. And in the near future, each athlete may be able to select the best sport for his or her body before ever setting foot on the athletic field. Already, a number of researchers believe that a major determinant of fitness in a sport is the nature of muscle tissue itself. According to exercise physiologist Michael Wolf, a fitness consultant based in New York City, there are four basic types of muscle fiberone "slow twitch" and three "fast twitch." Slow-twitch fibers, high in aerobic enzymes, are considered best for marathon running and other endurance activities in which a lot of oxygen is consumed. Fast-twitch fibers, especially the type highest in anaerobic enzymes, are better for such speed and power events as sprinting or weight lifting. Many scientists believe that by studying biopsies of an athlete's muscles and determining the ratio of fast- to slow-twitch fibers, they will be able to guide competitors into events that offer the best chance of success. But muscle tissue is just one factor to consider. Dr. James Nicholas, team physician for the New York Jets and director of the Institute of Sports Medicine and Athletic Trauma at Lenox Hill Hospital, in New York City, has begun developing an athletic aptitude screening tool simply called the Profile. The Profile, which Nicholas likens to a standard occupational profile, will include measurements of everything from heart rate and peripheral vision to limb strength and maximal oxygen volume. When such a system is complete, experts suggest, the next logical step would be to feed results into a computer programmed with the physical and physiological capabilities required for every major sport. The final printout would tell the athlete precisely what sports are best suited for his body. By examining the resilience and flexibility of the joints, for instance, testers would know whether an athlete can withstand the jarring pivots in tennis or the leaps and crash landings in basketball; by gauging the capacity of the heart and lungs, they would determine his endurance for such sports as swimming or running; by calculating equilibrium, they could predict his future as a platform diver or gymnast; and by determining his bone strength, they would encourage or discourage performance in contact sports like wrestling and football. In the future this sort of tool will be used increasingly early in life. Arthur Ashe. onetime Wimbledon and U.S. Open tennis champion and current coach of the U.S. Davis Cup team, notes that in public school there is tremendous peer pressure to go into one of four sports: football, baseball, basketball, or track. "Say a kid wants to be with his buddies and gets put on the football team almost out of sympathy." Ashe notes. "He just ends up riding the bench for the rest of his life. That doesn't do anybody any good. But if we can do tests of that child's body chemistry and composition as soon as possible, we'd be able to steer him toward a more appropriate sport instead." Even when athletes can choose their sport in advance, they'll still need effective training programs to succeed. Because of the dramatically expanding knowledge of physiology, this training will probably be a lot easier on their bodies and brains. Until recently, coaches tended to bludgeon athletes with training-they had them run as far, lift as much, and work out as long as they could without collapsing. Though no one knew exactly what worked, it was thought that the sheer magnitude of sweat and suffering would somehow do the trick. But through the partnership of medical science and computer technology, the athlete of the future will be given quality rather than quantity training. For example, a research team led by computer expert Jim Collins and physiologist David Costill, director of the Human Performance Lab at Ball State University, in Muncie, Indiana, has a computer program called Peak Performance for runners, swimmers; and cyclists. An athlete keeps a continual record of such vital data as weight, age, pulse rate, training distances. and race times. The computer responds with feedback on everything from calories that should be burned to how intense a day's workout should be. This helps the athlete develop a streamlined regimen (with only three high-stress workouts a week) that gets the job done efficiently and avoids injuries caused by overtraining. United States. He traveled to training sites throughout the country, setting up his equipment so that each time a swimmer completed a workout he could draw a drop of blood and measure the level of lactic acid. Soon Troup could predict how much lactic acid would be produced in each successive training session. By gradually building the workouts according to the charts he kept, he could almost always keep lactic-acid levels lowest and muscular endurance highest just before a major meet. "By using science to get rid of the guesswork, we avoid overtraining," Troup says. "We get the swimmer to his peak, and we get him there at the appropriate time." Precision training will help bring athletes to the limit of their natural potential. But a number of controversial new techniques may push them beyond it, blurring the distinction between the well-trained and the synthetic athlete. Although such official bodies as the U.S. Olympic Committee speak out vociferously against drugs and artificial forms of stimulation, many top scientists and athletes are quietly exploring these areas in the hope of creating an entirely new standard of athletic achievement. One of the leaders in this effort, naturally enough, is Ariel, who continues his research at the Coto Research Center, located in the posh Orange County, California, resort of Coto de Caza. In collaboration with Emory University physical therapist and anatomist Steve Wolfe, Ariel is pioneering an amazing technique that will record the muscle patterns of athletic superstars and transfer them to other promising athletes. According to Ariel, the idea originated with a physical-therapy technique used on stroke patients at the University of Massachusetts. The Massachusetts scientists, says Ariel, used an electromyograph (EMG) to record electrical signals from the arm muscles of normal subjects. The electromyogram, stored in a computer, could stimulate the stroke victims' arms through electrodes attached to the skin. In most instances, these paralyzed patients eventually recovered at least partial use of their limbs. Ariel and Wolfe decided to use a similar technique to augment the muscle power of athletes. "What we did," Ariel explains, "was take an EMG of muscles in an athlete's arm or leg. Like the Massachusetts team, we encoded the signal in a computer. Then we had the computer feed that same signal through electrodes right back into the athlete's body during training." At this point, Ariel explains, the athlete was using not just his own muscle power but also the electronic stimulation provided by the electrode. "The firing characteristics of the muscle fibers were reinforced," says Ariel. "The stimulation built more muscle fibers faster and sped up their contraction time." Soon the muscle performed in the augmented fashion, whether the electrode was present or not. Eventually Ariel took the concept a step closer to the work done at the University of Massachusetts. Using the radical technique known as EMG cloning, he tried to reproduce muscle patterns of superstars in aspiring superstars. "We took electrical signals from the muscles of Olympic champions," Ariel explains, "and put them into the athletes we were trying to train." Though the results of this research are not in, Ariel sees tremendous potential. "They've already been using the technique for rehabilitation with enormous success," he says, "and there are no side effects." While Ariel has been trying to augment the body's electrical patterns, other researchers have begun to test powerful new drugs. Actually, American athletes have been experimenting with drugs ever since the Fifties, when U.S. team physician John Ziegler met some Russian colleagues in Europe. Hoping to prove that Soviet athletes held dominion over the rest of the world, the Russian doctors were pumping their charges full of anabolic steroids-artificial male hormones that increase weight and strength. Not to be outdone, Ziegler raced back to the states and created Dianabol, the gold standard for steroids ever since. Today, many athletes have tried not just anabolic steroids but also genetically engineered synthetic human-growth hormone, manufactured primarily to stimulate growth in extremely short children. 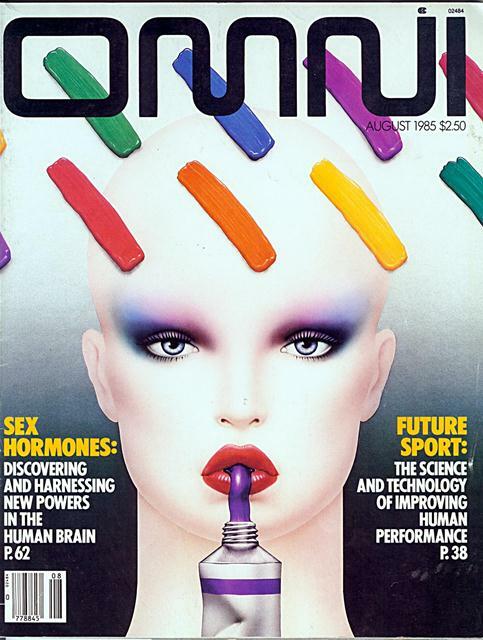 And according to Florida physician William N. Taylor, author of Hormonal Manipulation: A New Era of Monstrous Athletes, there are other genetically engineered hormones on the horizon, including growth hormone releasing factor and somatomedin-C. Both are known to dramatically stimulate human growth. Those who strongly oppose the use of drugs in sports say that hormonal substances like steroids can devastate an athlete's body, with effects ranging from sterility and liver damage to heart disease and cancer. "Five to ten years from now the records may fall, but the athletes may fall soon after." says Edwin Moses. "Drugs are becoming more and more widely accepted, and they'll endanger sports if they're not controlled." But some athletes have begun to advocate development of a true drug science in sports. "I say open it up," says Carl Lewis, winner of four gold medals in the long jump and sprints at the L.A. Olympics. Lewis himself does not use drugs but believes that "doctors should start prescribing drugs legally and testing people to make sure everything's okay. If these drugs are in fact harmful, then we'll be able to change them and make them better for everyone." analyzing performance. as we see the interactions an~!ng various hormones, vitamins, nutrients, and enzymes, we'll be able to supplement our deficiencies safely, so that athletes can perform better over a longer period of time." Some researchers, for instance, have begun to discuss chemical means of increasing not just size and strength but endurance. Ariel, who does not endorse the use of drugs, nonetheless wants to chemically slow the body's metabolism to increase the energy gleaned from each morsel of food. "The muscle cells store fats and carbohydrates, which break down chemically to restore ATP (adenosine triphosphate], the body's immediate source of energy for muscle contraction," Ariel explains. "You have only so much ATP In your body; in a sprint the rapid muscle contractions burn it all up. If you're running the four hundred meters, which requires both sprinting and endurance, you've got to pace yourself or you'll exhaust your supply too early in the race and be forced to slow down." But if scientists could stimulate ATP production with some "natural substance," says Ariel, "the sprinter could go all out in the four hundred meters without having to slow down." In addition. IBM biochemist David Cope is trying to increase endurance by altering the ammonia cycle, associated with metabolism of amino acids found in protein. When amino acids are broken down by the body for energy. ammonia is the waste product that results. Until the ammonia is converted to urea and excreted, it is toxic. Like lactic acid, it slows the body down. The solution. Cope suggests. might be to inject potassium and magnesium esparte salt into the body, to help it remove ammonia faster and thus perform at a peak level longer. But the athlete is not just a jigsaw puzzle of muscle and hormone; as with all complex things. there are intangibles to consider. Behavioral scientists working with athletes today have been seeking to harness the ultimate intangible-the unconscious itself. Psychologist Bruce Ogilvie, often called the father of sports psychology, says that his discipline has come out of the closet in the last few years. Back in the Sixties, when his services were first sought by a handful of pro football teams, he had to travel incognito. Today he has helped 38 professional sports teams, and in the last Olympics alone, he was invited to work with 48 athletes. 38 of whom ended up winning medals. Following in Ogilvie's footsteps, literally dozens of psychologists have become involved in sports because athletes and coaches have increasingly and unabashedly sought them out. And as the number of sports psychologists has grown, so has their body of technique. In recent years, they have even developed an array of specialized performance-enhancement strategies built on the principles of behavior modification. Most high-level athletes today would not blink twice, for example, if you spoke about "self-talk" (positive reinforcement based on the way an athlete talks to himself during competition). "visualization" (mental rehearsal of a successful step-bystep performance), or "reading motor cues" (noticing physiological signs, such as tightness. that indicate when stress is about to interfere with performance). 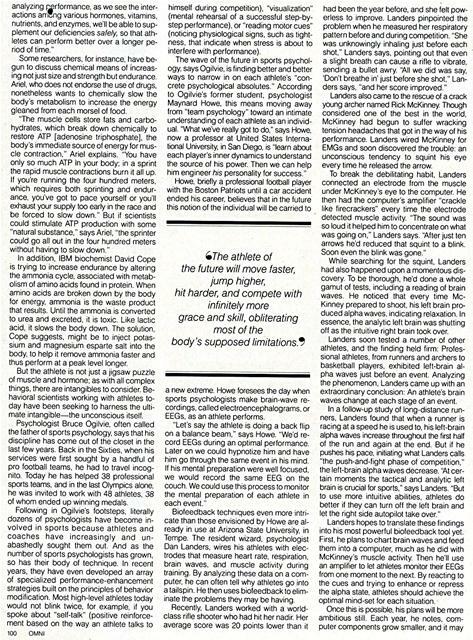 The wave of the future in sports psychology, says Ogilvie, is finding better and better ways to narrow in on each athlete's "concrete psychological absolutes." According to Ogilvie's former student, psychologist Maynard Howe, this means moving away from "team psychology" toward an intimate understanding of each athlete as an individual. "What we've really got to do," says Howe. now a professor at United States International University, in San Diego. is "learn about each player's inner dynamics to understand the source of his power. Then we can help him engineer his personality for success." Howe, briefly a professional football player with the Boston Patriots until a car accident ended his career, believes that in the future this notion of the individual will be carried to a new extreme. Howe foresees the day when sports psychologists make brain-wave recordings, called electroencephalograms, or EEGs. as an athlete performs. "Let's say the athlete is doing a back flip on a balance beam," says Howe. "We'd record EEGs during an optimal performance. Later on we could hypnotize him and have him go through the same event in his mind. If his mental preparation were well focused, we would record the same EEG on the couch. We could use this process to monitor the mental preparation of each athlete in each event." Biofeedback techniques even more intricate than those envisioned by Howe are already in use at Arizona State University, in Tempe. The resident wizard, psychologist Dan Landers, wires his athletes with electrodes that measure heart rate, respiration, brain waves, and muscle activity during training. By analyzing these data on a computer, he can often tell why athletes go into a tailspin. He then uses biofeedback to eliminate the problems they may be having. Recently, Landers worked with a worldclass rifle shooter who had hit her nadir. Her average score was 20 points lower than it had been the year before, and she felt powerless to improve. Landers pinpointed the problem when he measured her respiratory pattern before and during competition. "She was unknowingly inhaling just before each shot," Landers says, pointing out that even a slight breath can cause a rifle to vibrate, sending a bullet awry. "All we did was say, 'Don't breathe in' just before she shot," Landers says, "and her score improved." Landers also came to the rescue of a crack young archer named Rick McKinney. Though considered one of the best in the world, McKinney had begun to suffer wracking tension headaches that got in the way of his performance. Landers wired McKinney for EMGs and soon discovered the trouble: an unconscious tendency to squint his eye every time he released the arrow. To break the debilitating habit. Landers connected an electrode from the muscle under McKinney's eye to the computer. He then had the computer's amplifier "crackle like firecrackers" every time the electrode detected muscle activity. "The sound was so loud it helped him to concentrate on what was going on," Landers says. 'After just ten arrows he'd reduced that squint to a blink. Soon even the blink was gone." While searching for the squint. Landers had also happened upon a momentous discovery. To be thorough, he'd done a whole gamut of tests, including a reading of brain waves. He noticed that every time McKinney prepared to shoot, his left brain produced alpha waves, indicating relaxation. In essence, the analytic left brain was shutting off as the intuitive right brain took over. Landers soon tested a number of other athletes, and the finding held firm: Professional athletes, from runners and archers to basketball players, exhibited left-brain alpha waves just before an event. Analyzing the phenomenon, Landers came up with an extraordinary conclusion: An athlete's brain waves change at each stage of an event. In a follow-up study of long-distance runners, Landers found that when a runner is racing at a speed he is used to, his left-brain alpha waves increase throughout the first half of the run and again at the end. But if he pushes his pace, initiating what Landers calls "the push-and-fight phase of competition," the left-brain alpha waves decrease. 'At certain moments the tactical and analytic left brain is crucial for sports," says Landers. "But to use more intuitive abilities, athletes do better if they can turn off the left brain and let the right side autopilot take over." Landers hopes to translate these findings into his most powerful biofeedback tool yet. First. he plans to chart brain waves and feed them into a computer, much as he did with McKinney's muscle activity. Then he'll use an amplifier to let athletes monitor their EEGs from one moment to the next. By reacting to the cues and trying to enhance or repress the alpha state, athletes should achieve the optimal mind-set for each situation. soon be possible to make a heart, brain, or muscle sensor the size of a dime. These sensors, attached to the athlete's body or clothing, would radio information to a nearby computer for analysis. An instant biofeedback tone would be transmitted from the computer to a tiny plug in the athlete's ear. "This is imminent," Landers predicts. "We've got to put the components together, but most of the basic technology is there." It seems clear that Landers, Ariel, and their countless scientific brethren are already redefining the criteria for athletic excellence. 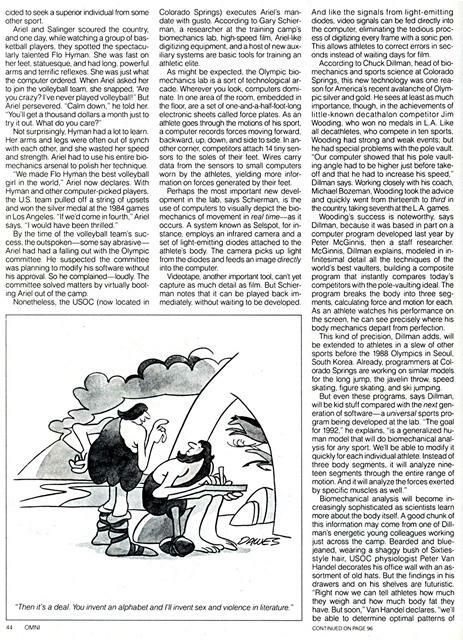 Dardick predicts that American athletes will be carried to an unprecedented plateau before the next Olympics. "There's no question in my mind that we're going to blow the world away in the next four years," says Dardick. "We'll be number one in 1988 with or without the Soviet bloc teams." Equally optimistic, Dr. Kenneth Cooper, father of the American aerobics revolution and director of the renowned Aerobics Center, in Dallas, believes that all the most cherished world records will soon be demolished. "We'll see things like a sub-two-hour marathon and a sub-three-minute forty-second mile in perhaps twenty years," he says. The more impressive the accomplishments, though, the more insistent certain questions may become. For example, as sports tend to become a 50-50 partnership between scientists and competitors, will athletes be sacrificing their personal freedom? And as they become more dependent on science, will they still be athletes in the original sense of the word, or will they simply be receptacles for technology? Ken Cooper, for one, sees these as real concerns. "I'd hate to see all of this go too far, until the Olympics become nothing but a year-2050 space-age war between countries trying to prove their technical superiority," he says. Dardick, however, has no such worries. "We have simply evolved," he says. "Today science and technology are part of us. How can we divorce science from athletics when we don't divorce it from anything else in life?" 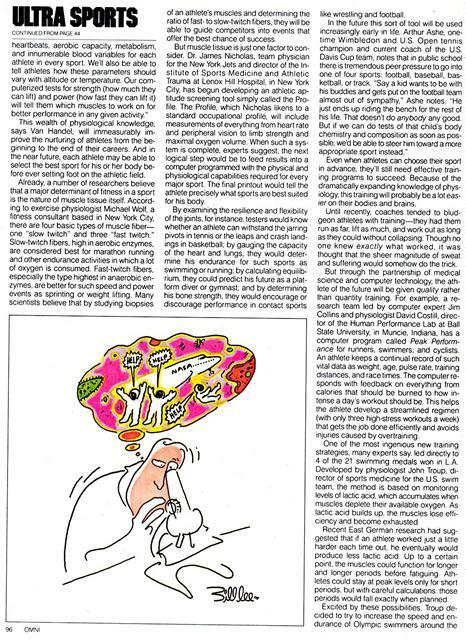 The real question, Dardick contends, is not whether we should use science in sports, but rather, how. Right now, he says, a vast store of data on subjects including bionic joints, protein computer chips, circadian rhythms, brain hormones, and nuclear magnetic resonance exists outside the athletic arena, not yet accessible to researchers investigating sports. "There's a tremendous order in the universe, a pattern, and if we want to command the potential of nature, it's a pattern we'll have to understand," Dardick says. "We have to take that pattern and make it useful to the athlete." The key word in Dardick's vision, Moses would agree, is useful. The athlete is still the irreducible force, and he must use technology only as it serves his needs. "You can't use science to manufacture an athlete," Moses says. "Raw talent still beats mass production. My scientific approach is not imposed on me. It's completely natural; it just makes it easier to accomplish what I do. " Generated on 4/20/2019 3:19:26 PM (PST) ADI/HQ/GBA/2019/ARIELCLOUD/v3.0.2018.0126.